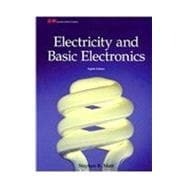 Electricity and Basic Electronics teaches basic theory and fundamentals and is a starting point for careers in electronics. The text is clearly written and highly illustrated, making it easy for beginners to understand. Numerous examples walk students step-by-step through circuit analysis where applicable. The Practical Application features cover topics such as breadboarding, soldering, and reading voltage on an oscilloscope. The Project features allow students to build items such as a continuity tester, blown fuse indicator, and power supply. Math Focus features provide students with a quick review of the basic math skills they need to understand the topic at hand. Math topics covered are exponents, scientific notation, metric and electrical prefixes, order of operations, algebraic equations, adding fractions, ratios and proportions, and square roots. A chapter called "Energy Conservation" covers ways to conserve energy and alternative forms of energy.